Sometimes in science there are unexpected threads tying seemingly very different things together. Unraveling the knots in these threads can lead to new insights into important developmental processes and mechanisms of disease. My lab studies epigenomic and transcription factors including a molecule called histone variant H3.3 (more here on H3.3). H3.3 binds to the actual thread of DNA to create very different kinds of chromatin states than those made by the more traditional canonical histone H3 family members. Think of H3.3 as the unorthodox member of the histone H3 family. Recent studies have indicated that H3.3 plays key roles in both stem cells and cancer. H3.3 has a powerful, unique impact on which genes are turned on or off in cells and in turn how cells decide how to structure their chromosomes including both stem cells and cancer cells. The jobs of H3.3 of essentially being a gene thermostat and of regulating genomic architecture are fundamental to a variety of cellular and organismal process including as it turns out both sperm development and brain tumors. For better or worse, H3.3 is a key conductor of both of these processes. My lab just came out with a new paper in the journal Development in which we knocked out one of two genes that make H3.3 protein and got some surprising results. Wait, you say, two genes make H3.3? Yes. Histones more generally are unusual proteins in a number of ways including the fact that more than one histone gene will make exactly the same histone protein. This is, of course, very different than most protein-coding genes that follow the one gene-one protein rule. The two genes that make H3.3 protein, H3f3a and H3f3b, are expressed differentially so cells may make their total pool of H3.3 protein only from the “a” gene or only the “b” gene or from both. We knocked out the “b” gene. For about half the mice lacking “b”, this meant that embryonic development failed. Interestingly, almost every surviving “b” knockout mouse was infertile including all males and just about every female. Why did this happen? The b-deficient germ cells, the cells that make sperm in males and eggs in females, essentially had a monkey wrench thrown into their chromatin machinery due to the fact that they had very little H3.3 protein. As a result, some genes switched inappropriately into “on” mode, while others that were supposed to be active were switched off. The germ cell DNA was also not packaged properly. The end result was dead or dysfunctional sperm. In addition, earlier on in the spermatogenesis process, specific more primitive germ cell populations in the “b” knockouts died as well. One of the most prominent epigenetic factors involved in this germ cell phenotype in the “b” knockout mice was a histone mark called trimethylation of lysine 9 of histone H3 (H3K9me3). Histone marks constitute a code that helps regulate gene expression and chromatin architecture. H3K9me3 seem to help shut genes off. With very little total H3.3 protein in the “b” knockout mouse germ cells, H3K9me3 accumulated abnormally (see image above of immunostained testes from Figure 3B: blue is DAPI and green is H3K9me3, with the bottom gray panels being H3K9me3 alone). 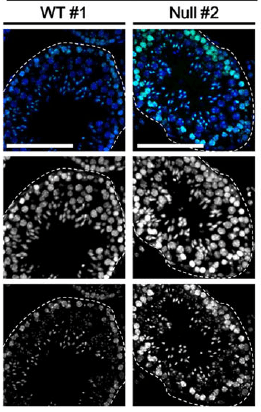 We think this excess H3K9me3 played a central role in germ cell dysfunction and in infertility in the knockouts, but other histone marks were altered as well. Turns out that the other H3.3-coding gene, H3f3a aka the “a” gene, is also required for normal murine sperm development too, but in addition in the humans the human version of the “a” gene (called H3F3A) is mutated in some of the most lethal of all childhood brain tumors called glioblastoma and diffuse intrinsic pontine glioma (DIPG), both called high-grade gliomas more broadly. H3F3B (the human form of the mouse “b” gene) is mutated in other human childhood tumors including bone and cartilage tumors. Therefore, mutated histone H3.3 is a new oncoprotein and H3F3A and H3F3B may normally act as tumor suppressor genes in a variety of tissues including brain, bone, and cartilage. We think that what H3.3 is doing normally in germ cells to maintain fertility and what goes wrong there when we lower H3.3 levels both have some things in common with what H3.3 is doing so wrong when it is mutated to lead to brain tumors. One of our lab’s big picture goals is to help to develop new treatments for pediatric gliomas because today sadly most of these children die within just a year or two of diagnosis even with today’s best treatments.How these H3.3 mutations lead to these lethal brain tumors in kids is not clear, but our lab and many others are working to figure this out. You can bet that chromatin and epigenetics have a lot to do with it and surprisingly insights from how H3.3 normally functions in germ cell development could help us figure out how H3.3 leads to cancers when it is mutated in people.